We invite you to join us for the 2019 Whittier Alliance Annual Meeting, coming up on Tuesday, March 26th from 5:30--8:00 pm! 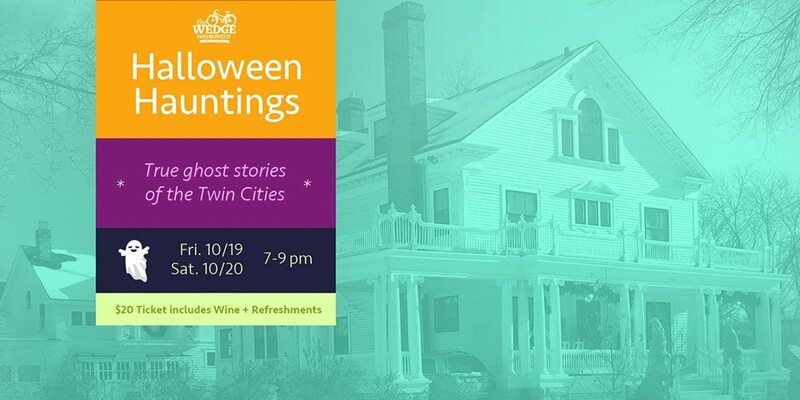 For the first time, we will be holding the meeting at Minneapolis College of Art and Design (MCAD), located adjacent to the Minneapolis Institute of Art at 2501 Stevens Avenue right here in Whittier. MCAD has generously offered to host this community event in their main auditorium, accessible from both the north and south entrances of the building, in order to provide more seating and accessibility for our event's growing attendance. As always, the evening will kick off with a Whittier Community Resource Fair and complimentary food and beverages from neighborhood restaurants from 5:30--6:30 pm. This is a great opportunity for residents, property owners, and even business community members to learn about some of the amazing organizations doing great work right here in the neighborhood and opportunities to get more involved. The registration period will also open at 5:30 pm for current Whittier residents looking to cast a ballot for the at-large Board of Directors candidates under consideration. Eligible voters will also have the opportunity to review and vote on Whittier Alliance's proposed 2019-2024 Strategic Plan and an NRP funding contract reallocation to properly support the goals and strategies laid out therein. The proposed plan was developed over the course of the past year based on community input in every stage of the process, and we invite you to review the final product via the PDF link below. 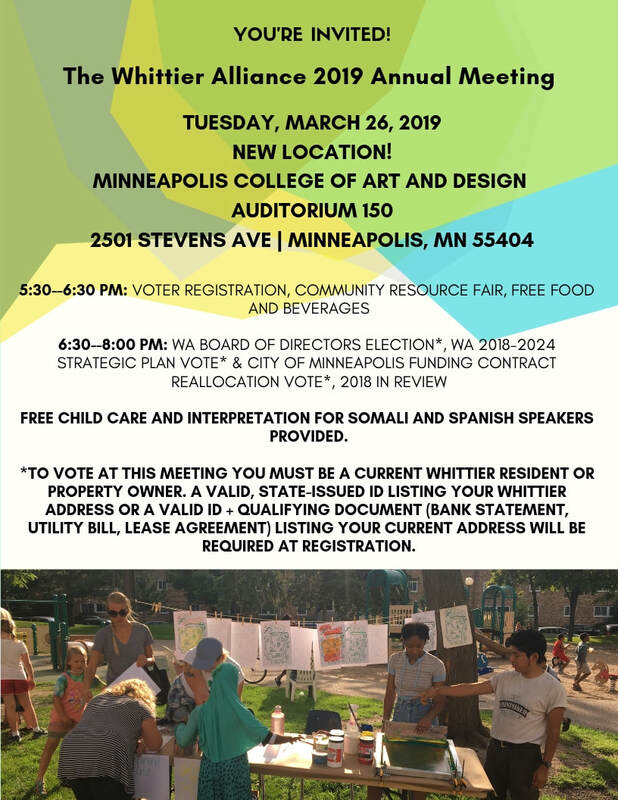 We hope you'll join us on March 26th to share your thoughts and support our efforts to put your fellow neighbors' ideas into real action over the next five years! ​All voters must bring a photo ID listing current Whittier address or photo ID with supporting documentation such as a utility bill or bank statement listing the current address in order to verify eligibility at registration. Property owners wishing to cast a vote must pre-register by providing ownership documentation in person at the Whittier Alliance office (10 E 25th St.) in advance of the meeting day. Questions? Reach out to our Executive Director, Kaley Brown, at kaley@whittieralliance.org anytime. Check out the full event page and Facebook event page for additional details. 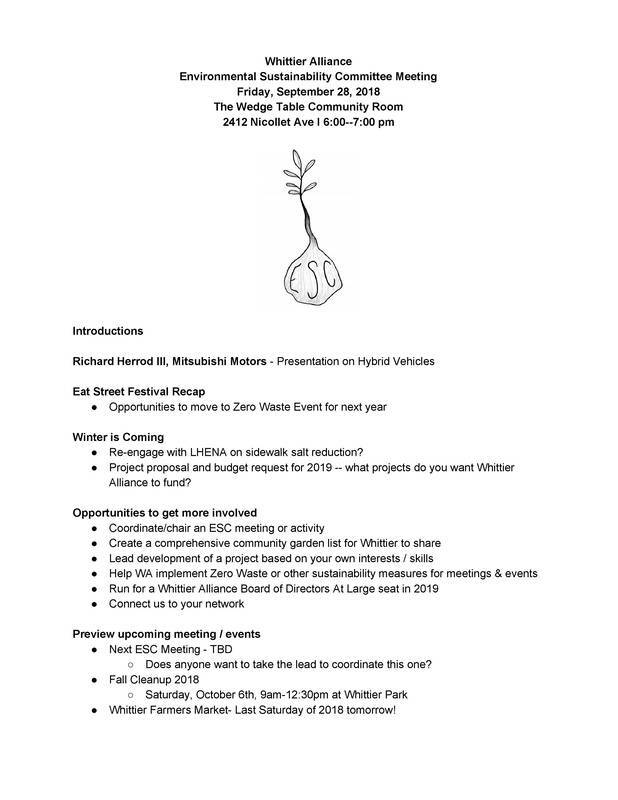 Whittier Alliance 2019 Board Candidacy Application Period Now Open! ​Are you interested in getting more involved with your neighborhood community this year? 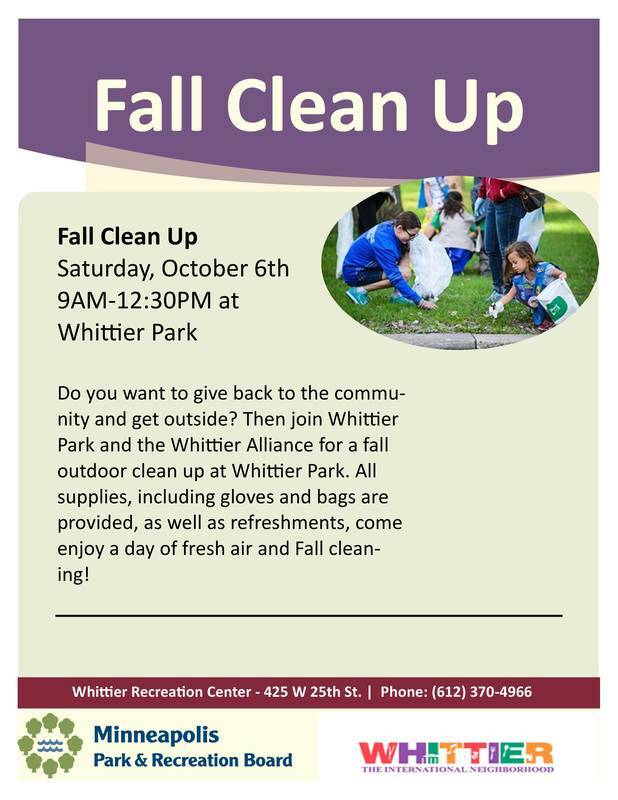 Do you care about Whittier's housing climate, environmental sustainability, and/or building relationships with your fellow neighbors? 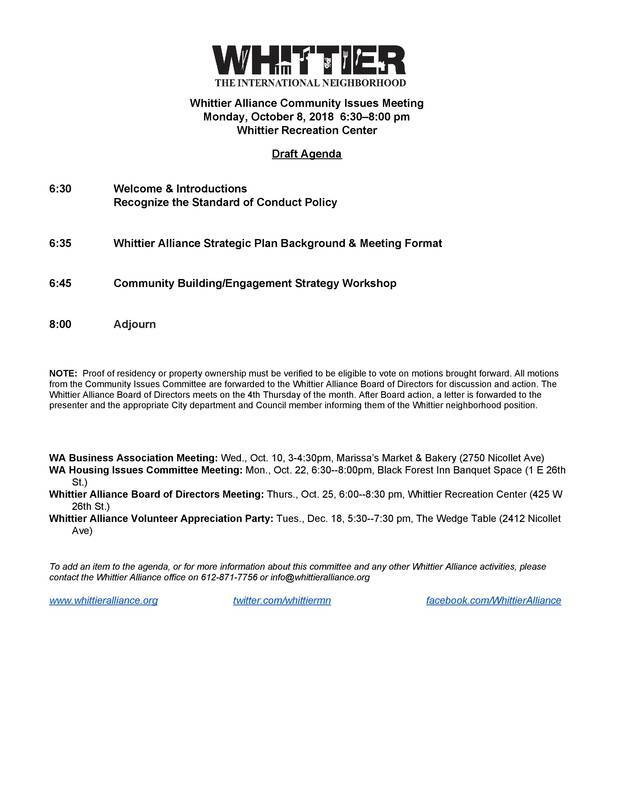 Each spring, a minimum of 5 at-large board members are elected by their community to serve a 3 year term on Whittier Alliance's Board of Directors at the Annual Meeting, coming up this year on March 26th, 2019. We encourage any community members who have an interest in serving the neighborhood, sharing their time and talents, and working as a part of our team to consider running. 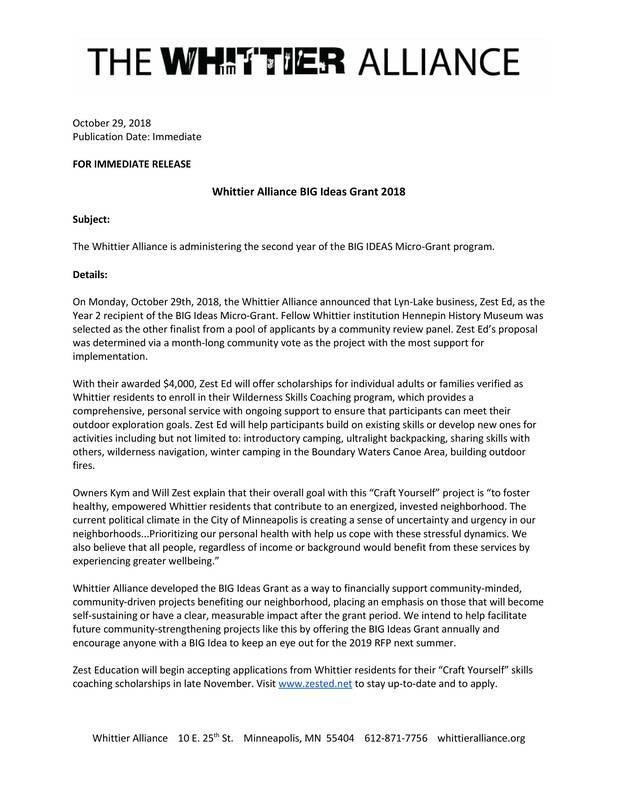 kaley@whittieralliance.org to confirm eligibility and learn more about the goals and initiatives that Whittier Alliance will be taking on in the coming years and how you could play a role. The candidate application form and Board of Directors job description are available below for viewing and download. All eligible candidates must return a physical application along with proof of 6 month Whittier residency or property ownership in person to the Whittier Alliance office (10 E 25th St.) no later than Friday, February 22nd, 2019 at 5:00 pm. Applications may be submitted during normal business hours (9am--5pm, Monday--Friday) or by appointment until the deadline. Join us for the November Community Issues Meeting on Monday the 12th from 6:30--8:00pm at Whittier Park (425 W 26th St.). 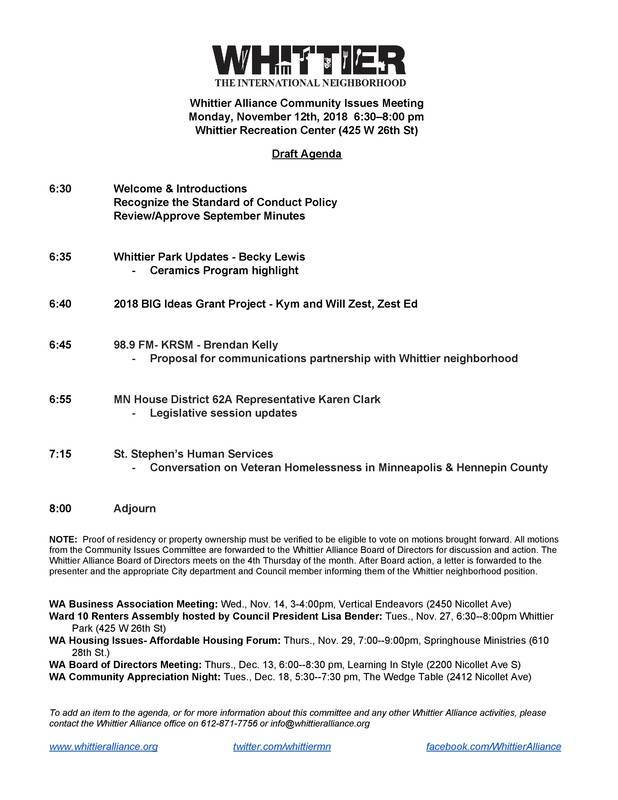 We'll have updates from neighborhood organizations, hear from Rep. Karen Clark as she prepares to hand over the reins to newly elected 62A Rep. Hodan Hassan, and have a community discussion on the work being done right here in Whittier to address veteran homelessness in Minneapolis and Hennepin County led by staff from St. Stephen's Human Services. A link to Rep. Clark's most recent legislative summary can be found below! 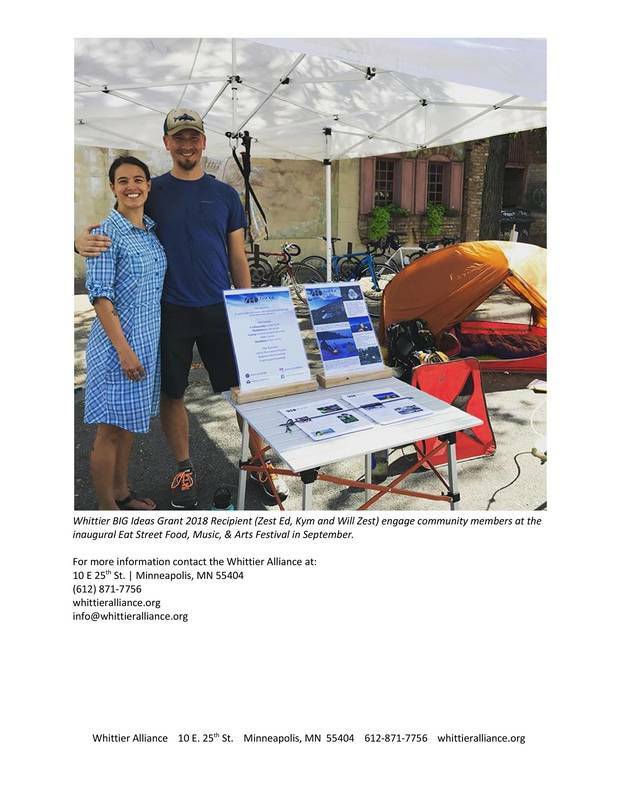 The votes have been tallied, and the winner of this year's BIG Ideas Grant cycle is Lyn-Lake start-up Zest Ed and their "Craft Yourself" wilderness skills coaching program! Check out the press release below for more details and stay up-to-date on their project at www.zested.net. 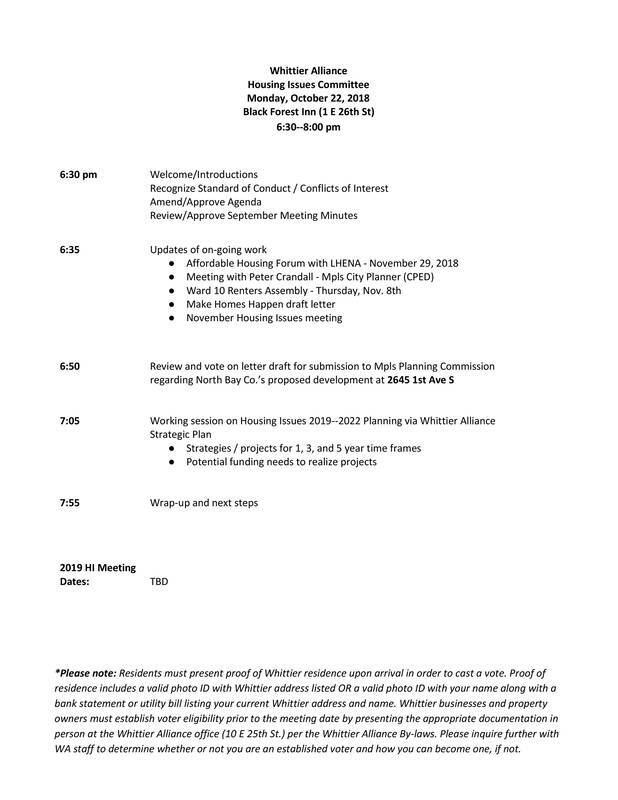 Check out the full agenda below. Any and all are welcome and encouraged to attend, so bring a friend or neighbor along with you!